If I have seen farther, it is by standing on the roof of the Green Building. It’s sort of funny how some of the most interesting things happen completely by chance. Case in point: About a month ago, I was heading from my lab to the tennis courts on the other side of campus to play a quick game with my friend Cody ’11. As I was passing by the grassy “Dot” beneath the Green Building – one of MIT’s academic buildings, home to the Earth, Planetary, and Atmospheric Sciences Department – I noticed a few people standing around a tripod of some sort. I wasn’t terribly concerned, until one of the people started waving at me – it was Cody! I hustled over and found that Cody and I had both stumbled into an impromptu photo session on the Dot being held by a mutual friend, Christian Ternus ’10, accompanied by Liz ’11 (at MIT, we always put our class year by our name, even when speaking in casual conversation :D). Ternus had recently gotten hooked on high dynamic range (HDR) photography, so he had been roaming around campus taking photos. As it happened, Ternus’ photographic agenda included a rather interesting but incredibly appropriate location: the roof of the Green Building – which is, incidentally, the tallest building in Cambridge. Of course, as a general rule access to the roof of the Green Building (as with most buildings at MIT) is prohibited. But the Green Building’s prodigious heights makes it useful not only for photography but also for other things, such as Course 12 experiments and the MIT Radio Society, of which Ternus is a member. Long story short, Ternus explained to Liz, Cody, and me that he was going to be heading up to the roof of the Green Building in order to double-check the radio equipment as well as take a few photos, and would we like to come along with him? 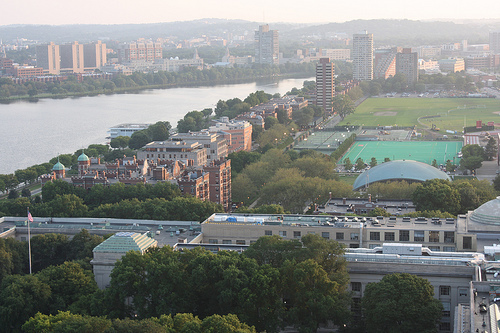 An aerial view of Main Campus (including MIT’s trademark twin domes) and West Campus. Main Campus includes most of the original academic buildings, while West Campus consists mainly of dorms and other student-focused buildings (such as the Student Center, the Chapel, Kresge Auditorium, and the athletic facilities). A zoomed-in shot of West Campus, including Kresge Auditorium and Dorm Row. From foreground to background (east to west), the dorms are New Ashdown, McCormick, Baker, Burton-Conner, MacGregor, New House, and Next House. The Harvard Bridge and the southern end of Killian Court. 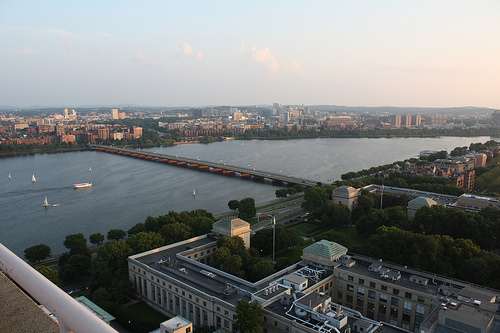 Despite its name, the bridge doesn’t actually touch Harvard; rather, it connects MIT’s campus to Boston proper. 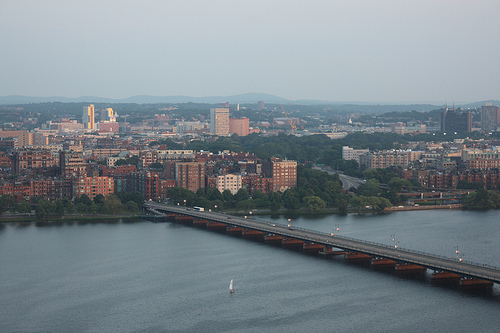 Another view of the Harvard Bridge and Boston’s Back Bay neighborhood. 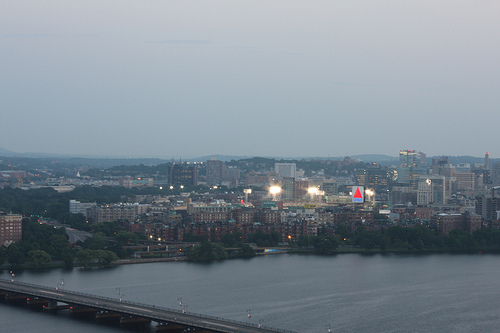 Fenway Stadium, complete with lights – there was a game playing that night. Another shot of the Harvard Bridge, featuring Liz, myself, and Cody. An up-close view of the mysterious weather dome on the Green Building, which has been the target of a handful of hacks, such as the Magic Pi Ball in 2001. The same photo, but with more extreme tone mapping. 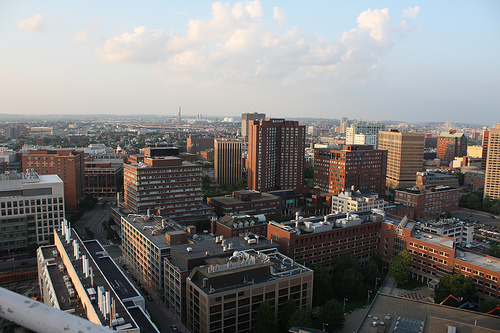 A view of the city of Cambridge, with some of the East Campus buildings (including MIT Medical) shown in the foreground. A shot of the downtown Boston skyline; Senior Haus and the under-construction Media Lab Extension are visible in the foreground. 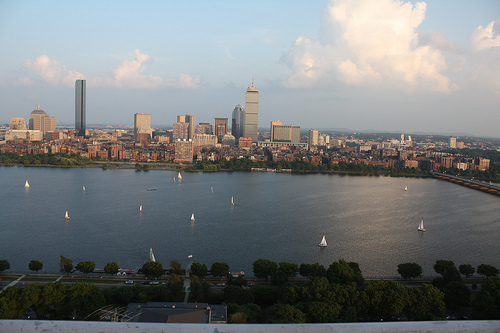 A beautiful shot of the Charles River. 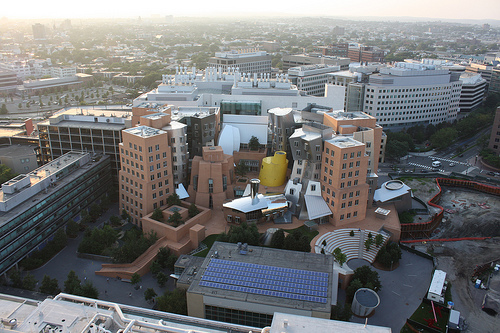 An aerial view of Stata Center, which is occasionally mocked as one of the weirdest looking buildings on campus (even by MIT’s standards). From this view, though – which is undoubtedly how the architect looked at it when he was making his models – it almost seems to make sense. The site of the future Koch Institute! 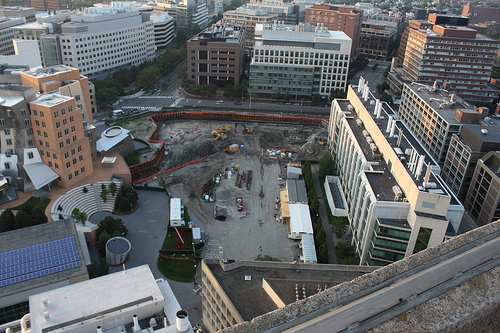 Nestled between the Stata Center and the Biology Building, the Koch Institute will officially be numbered Building 72. Although Cody and I left a little before sunset in order to play tennis, Ternus and Liz stayed on the roof and took some more photos, which turned out to be some of my favorites. Another long exposure on the Harvard Bridge. 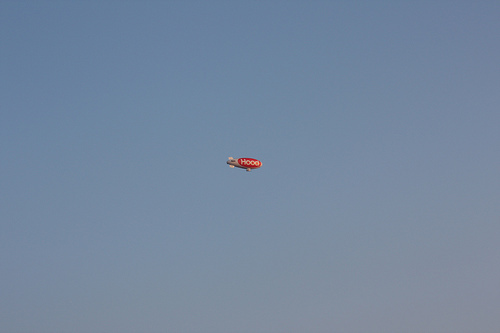 For even more photos, feel free to check out Ternus’ flickr page. haha, and also, I enjoy that everything at MIT is numbered. Even the people. I have very limited photography experience. That said, the pictures are awesome! Wow. I love night HDR shots and these are no exception. Glad to know that it seems like I wouldn’t ever be bored when looking for things to take pictures of around there. HDR photography is awesome (and Ternus’ photos are pretty great). One of the girls in SP.747 with me last semester did her final project on HDR, using photographs of Lobby 7. Also, awesome view!!! Sooo, how DID you get up onto the Green Building? Elevator. It was a completely legal trip. Wow! Those photos are just stunning! I bet the view is amazing to actually see. I can see my lab window! When I saw the title I thought you are going to post some pictures of climbing mt. Everest…. But still, it’s amazing to climb up to the top of a high building too… with or without an elevator. I fear the wind can blow me away when I’m on a high attitude. (literally, like a kite). Did you know that when I.M. Pei was designing the Green Building, he wanted to create the tallest building in Cambridge, but Cambridge law had a limit on the number of floors that could be built. So, he built the maximum number of floors allowed but made the bottom floor really tall, so he got it to be the tallest building in Cambridge. Yay MIT ingenuity! Not to mention that afterward, the laws were revamped so that the building limit included a height limit so no one else could pull off the same thing – and hence, pending another revamp, the Green Building will remain the tallest building in Cambridge =). i liked the stata building before, but now, seeing from above, you’re right that it starts to come together and make sense. But my favourite picture was definitely, hands down, the golden one (taken after sunset) of Mass ave. The combination of all the lights and the different designs of buildings so close together that oddly didn’t seem to clash, reminded me of Corusant in star wars II. @Donald: I’ve added one photo where you can sort of see Senior Haus. I think the Green Building is actually too close to the East Campus dorm to get a good photo of it. I hate to parrot everyone else, but those are some awesome pictures! I agree that Stata looks interesting from that angle. No pictures of EC/Senior House area of campus.. is it too close to get a good focus with the lens or is it just not interesting? My God, these are gorgeous. =P MIT students NEED NUMBERS. Paul – wow. Those pictures are so breathtaking. I have immediately become a fan of HDRI. Now I must go look up prices hehe. The long exposure on the Harvard bridge is by far my favorite amongst the bunch. Those are really beautiful! I especially like the ones with the weather dome: they seem out of a science-fiction movie! Alright, so yesterday I was showing my friends around (I do HSSP through ESP on sundays) and I had in mind that elevator thing. We got in the elevator, and went to [what we thought was] the highest level you could go to on it, and ended up in offices. Floor 18. Does it go by any other name? 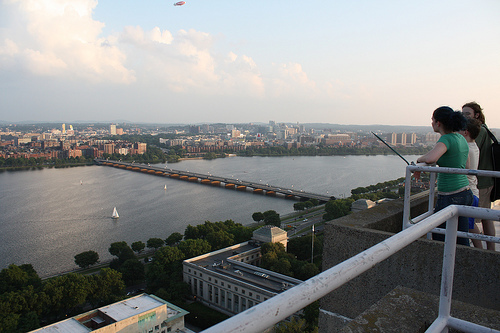 I mean, sure we probably shouldn’t be up there, but we were very excited to see Cambridge and Boston from that view. Was I totally off on how to get up there? Props on noticing my vagueness. Sorry to disappoint you: you are correct that the main elevator does not go to the roof. To get to the top, you need to take another elevator, which is under lock-and-key. Dude, Fenway PARK. Please don’t blend Yankee Stadium with Fenway Park ever again, I almost died. Very nice, thanks Ternus for the amazing photos, and thanks Paul for posting them! Can’t wait to get to campus! 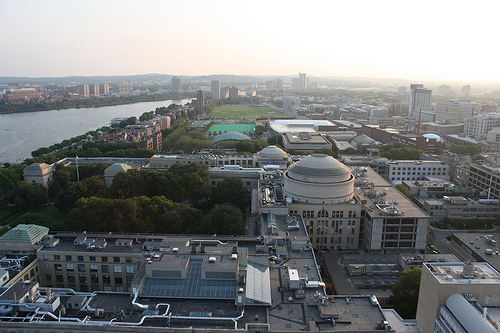 Looking at these photographs, I can’t understand why MIT is considered hideous.  Blogs with MIT pictures is the best way to attract Students to apply to MIT. Is Koch where you did your UROP in Cancer Research? How did that go by the way? 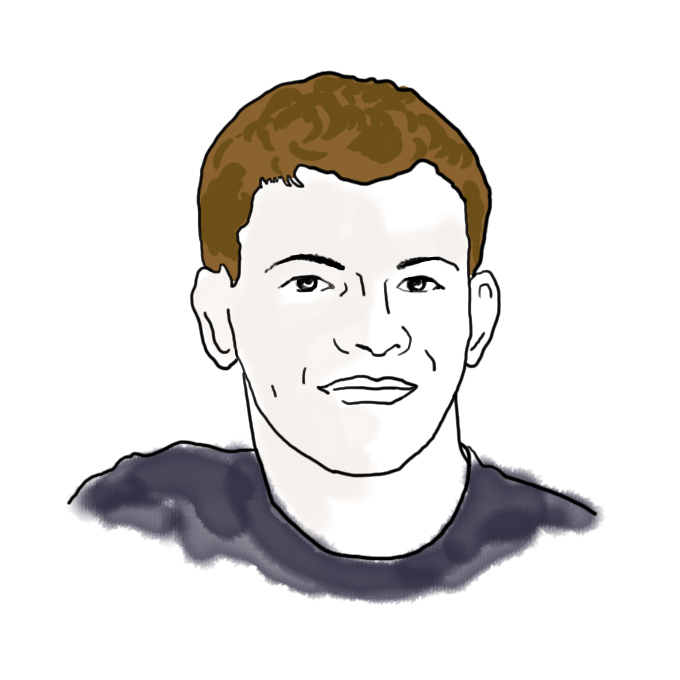 Will you write a blog about that before MIT starts? Those pictures are really amazing. I am actually in Jamaica now. 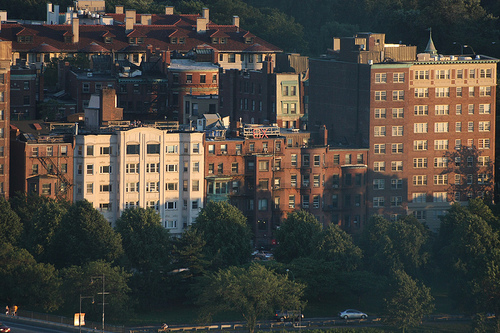 I visited Boston last year (2007) and these pictures really help to bring back memories of that great place. You all can give me a riong at (876) 459 8949.
technically, that’s not new ashdown (or even ashdown at this point), just W1. “New Ashdown” is NW35, the new grad dorm north of Simmons.